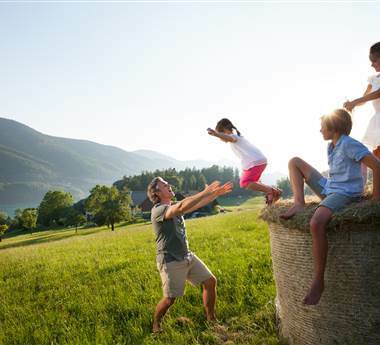 Find a selection of current last minute deals and special offers here! Simply fall into the luxurious bed made of solid wood in our PURADIES Deluxe Suite. Tradition meets style at the PURADIES hotel in Leogang. Only the finest materials and furnishings have been chosen and used in the PURADIES Deluxe Suite. 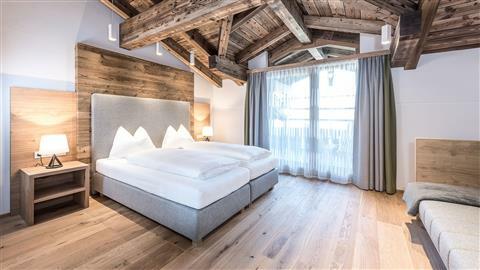 Each and every room and suite of our Leogang hotel is arranged with plenty of attention to detail and is sure to make your heart skip a beat. 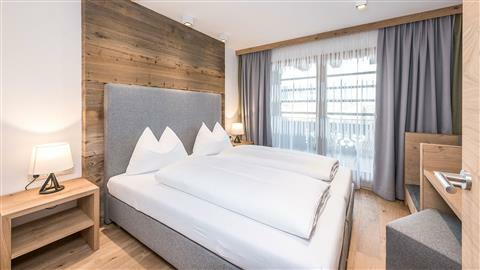 Whether you choose to relax in the restful oasis of your Deluxe Suite or take in the amazing views of the Leogang mountains from your terrace, you will be able to escape everyday life and all your worries. This incredible suite with combined living and sleeping area features a box-spring bed, spacious bathroom with special shower and large washbasin, separate toilet, hairdryer and cosmetic mirror, foyer with large wardrobe, free WIFI, phone, flat TV, minibar, air-conditioning, comfy lounge and daybed, reading nook, desk, large balcony with views of the garden with organic swimming pond and the Leogang mountains.